This post was done in partnership with Pure Leaf, who sponsored this post by providing compensation and the tea that you see in this post. As always, all thoughts and opinions are my own, and thanks for supporting Hummingbird High and my awesome sponsors! How's everybody's summer been going? Has it been sweltering for everybody like it has been in New York? I've complained about this in previous posts, but I'm NOT a summer person. I'm a fall/winter baby all the way — I'll take a cold blustery day any day over a muggy summer one! Sweater weather forever!!! So Erlend and I are back in Manhattan, camped out at his parents' place for the month of August while they hike the Colorado trail. And while their apartment is very, very lovely (it's right on the border of the UWS/Morningside Heights, just a stone's throw away from both Central Park and Riverside Park), their co-op building's temperature is centrally controlled and tends to run pretty hot (even in the summer!). We're set up with air conditioners, but it's still not really enough to beat the sun streaming in from their south-facing windows. In Brooklyn, I escaped the heat by going on breezy bike rides along the waterfront and/or counting on one of the neighbor kids to pop the cap off a fire hydrant 😳😳😳. But because you can't really get away with doing that in Manhattan (well, the biking, sure, but definitely not the fire hydrant tampering), I've been trying to find other ways to stay cool in the city. Luckily, we're closer to a lot of the awesome food places you always see on Instagram serving crazy milkshakes, insane ice cream scoops, and yummy-looking cold things to help beat the heat! 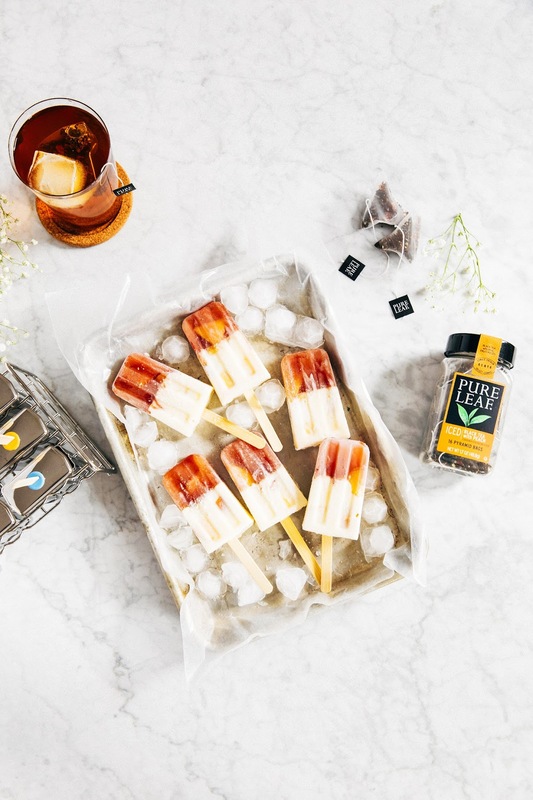 And today I've partnered with Pure Leaf to bring you these easy-peasy and incredibly tasty black tea and peach creamsicles. The popsicles are made with two types of peach flavor: Pure Leaf's Iced Black Tea with Peach (Pure Leaf's Home Brewed Iced Teas are new!) and are fresh, ripe peaches at the peak of their season. All of this wonderful peach flavor gets paired with a honey-infused Greek yogurt and cream base for the classic peaches and cream combination. It may seem like there's a lot of honey in the recipe, but note that the tea layer is unsweetened and that flavors tend to get muted when frozen — reducing the quantity is possible, but will likely lead to a less flavorful popsicle. 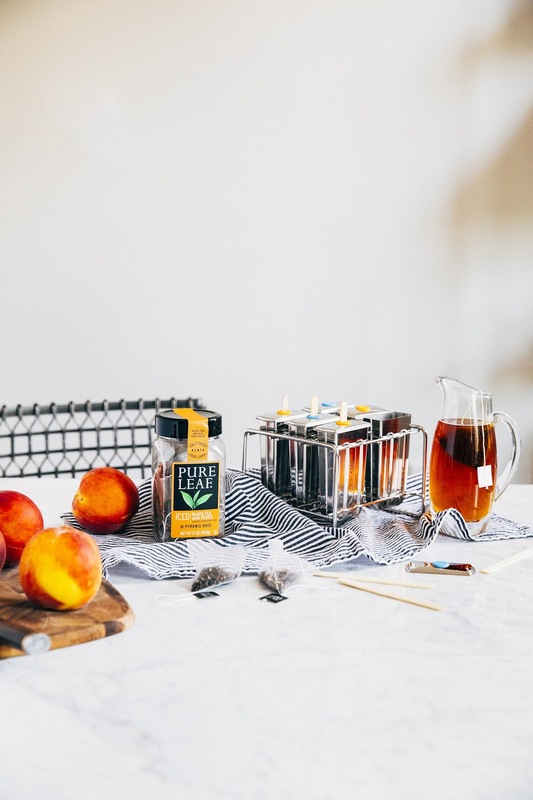 Ditto for the tea steeping — the recommended steeping time for Pure Leaf Iced Black Tea with Peach Flavor is actually 3 minutes when making a beverage, but I upped it up to 15 minutes to get an extra strong tea flavor for the popsicles. This was my first time making multilayered popsicles, and I was... bad at it? I foolishy poured in the first layer and let it freeze without the popsicle sticks embedded into it, thinking that I would be able to jam them in once frozen. Yeah, that didn't really work (it turns out solid ice is difficult to jam tiny wooden sticks into without a mallet), so I suggest freezing the first layer with the popsicle sticks already in place. You can easily pour the second layer on top of everything without affecting anything when the first layer and popsicle sticks have set! 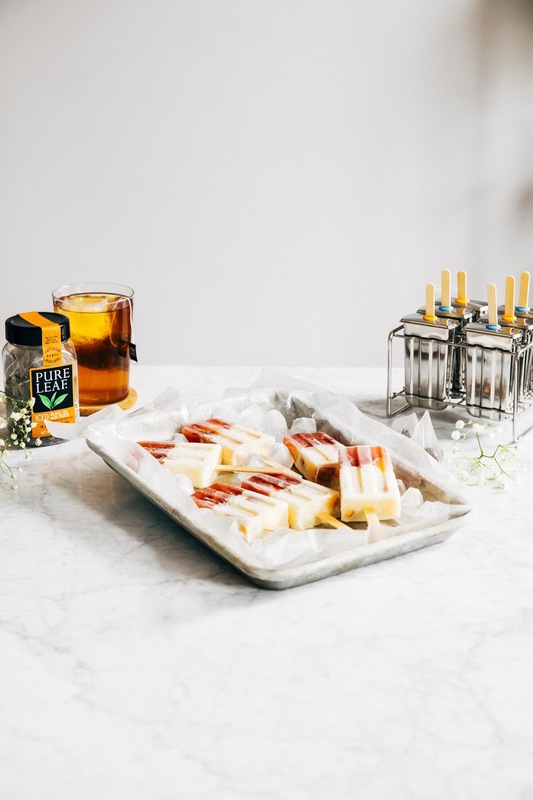 In a large liquid measuring cup, combine 1 1/2 cups boiling water and 2 Pure Leaf Iced Black Tea with Peach Flavor pyramid tea bags. Steep for 15 minutes, before discarding the tea bags. Carefully pour around 2 ounces of the tea into 6 popsicle molds. 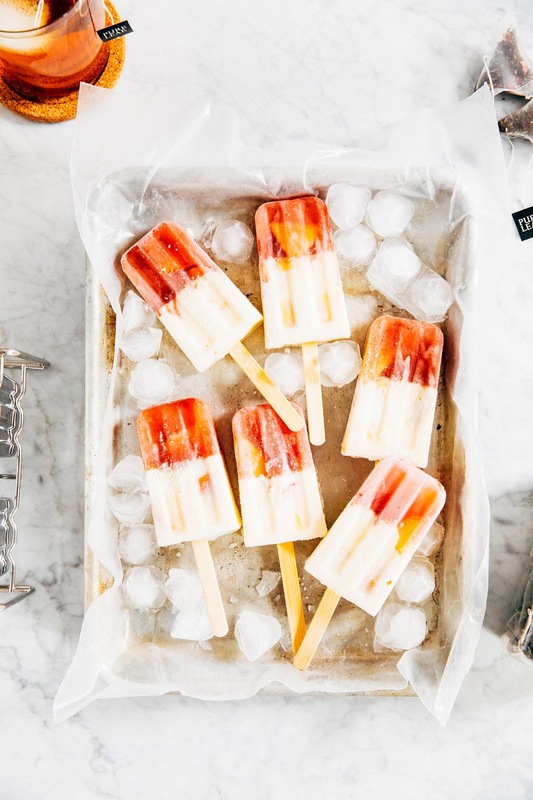 Drop a few peach chunks into each popsicle mold and transfer to the freezer to freeze for at least 3 hours to set. Once the tea layer has frozen, make the cream base. In a medium bowl, whisk together 1/2 cup Greek yogurt, 1/4 cup heavy cream, 3 tablespoons honey, and remaining peach chunks. Divide evenly between the 6 popsicle molds and transfer to the freezer to set for at least 5 hours, preferably overnight. 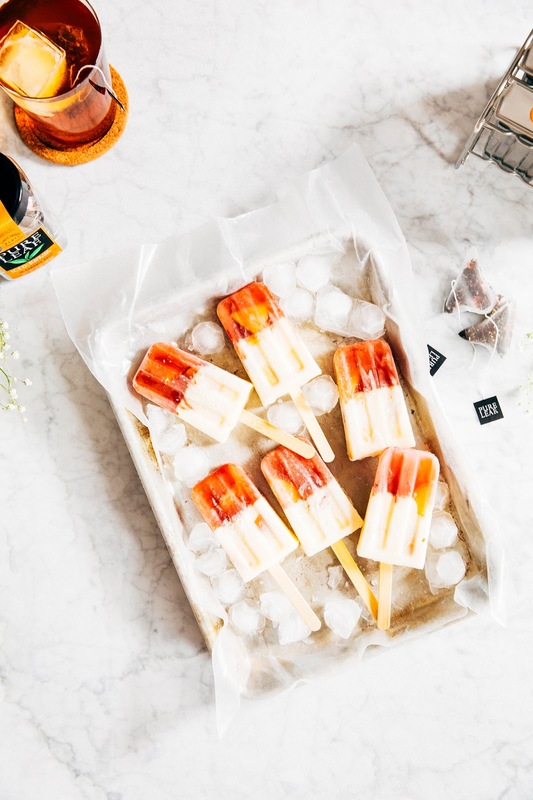 To serve, unmold each popsicle by dipping quickly in a tall glass of boiling water. Serve and enjoy immediately.